A huge pack of vector trucks made of vector shapes. This is a collection of 8 Truck graphics that will bring life to your designs. If you need some truck illustrations, this is the right resource for you… And it comes for free! These vector truck graphics can be used in many different designs – they are made in a modern flat style, so they are perfect for any projects. 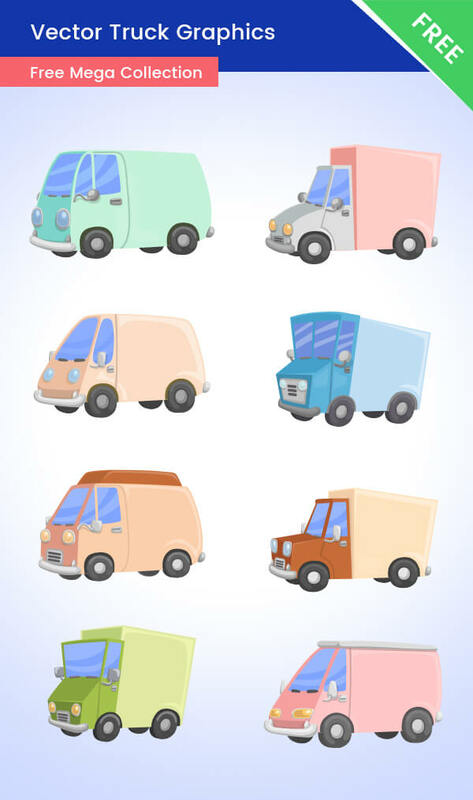 We’ve made them in modern colors and shapes, so don’t hesitate and grab your free truck vectors now. The possibilities are infinite – you can use them in delivery and transport designs, projects for children, and many more. Also, you can use these vector graphics to convey qualities like fast work, reliability, and strength. All of these vector vehicles are made of vector shapes, so you can use them in many different types of projects – you can scale them up as you need and you won’t lose quality. This makes them perfect for both high-quality web projects and print designs.